We have had a lot of residual ice left over from this winter in the Eastern end of Lake Ontario. This has impacted the start of the season so we moved the boat to Mexico, NY temporarily until the ice and fishing conditions improve in Henderson. Over the weekend we had a great couple of days with Mr. and Mrs Patrick McCormick, along with their parents. The first day out had us catching the first king of the year, as well as a 16 and 14 lb Brown. Sunday saw us limiting out with the browns by 11:00 am. The second day everyone was in full swing and no coaching was necessary. Had a lot of action, and a lot of laughs! I hope to see you guys again! We also had Bill Adams party from Janesville, NY. Day started out slow but we ended up eventually finding them and finished just one short of our limit. As many people already know the last week of August prior to the Labor Day Holiday is usually a great time to fish Staging Salmon right in the "Trench". However this year has been a little "weird" with certainly fish being in the trench but not necessarily biting that well. We have been making several moves each day to try and stay on whatever active fish we can find. These areas are either the "horseshoe" off Stony Creek, the "Wall", and the "Haystack" off the lighthouse and Stony Island. I'd like to extend a special thank you to Rob Katlin who fished with me a total of five (5) times this year. Twice in the spring for Walleyes and browns, and then three times this week for Salmon. He has certainly become a friend and pitches in rigging on the boat when things start getting busy with the fish. I had a great three (3) days with him, his son and his Dad. They stuck through some slow periods, and persisted in getting some great catches into the boat during a tough / strange bite. Also Mike, Bucky, Whitey and Chris.....they have been fishing with me for years and there trips are always a highlight of the year. They certainly know how to have alot of fun both on and off the boat! And also Bill Adams from Jamesville, NY.....another great group of sportsman. I am VERY BLESSED with alot of repeat customers year in and year out. Please remember that we still have some great dates available both for September and right into October. The fish have been staging in the trench and off both the north and south dunes. Flasher flys have been work best at 2.0 - 2.3 knots. Fish have been corkscrewed to the bottom due to the warm water lately. However, some colder water has moved in making the fish a more active. This last weekend I had the pleasure of working with Lots A Limits charters on a group from Long Island on Saturday August 17th. Made a new friend "Red" who works for AT&T, and also has a great back yard BBQ service. Had a great time with his team of guys, alot of laughs, and yes we even managed to catch a few fish as well. Took us awhile to find the fish but when we did we had alot of doubles and even a few triples. BTW....THAT'S WHY I ALWAYS suggest a FULL day trip....in case the fishing is tough....it gives us time to look and find the more active fish. We ended up limiting out on the trout within a few hours. Thanks to both Tim Meador, and Red for a great day. Sunday (8/18/13) we took out Mike McMannis. He just wanted to focus on getting a few salmon for his son before he goes off to college this fall. Mike has been fishing with me for years and we alwaysd look forward to having him on the boat. We did manage a few salmon and a couple of browns. We marked thousands of salmon but the warm water had them lying on the bottom and not very active. This last Saturday (8/10) I had the pleasure of taking out the Altersian Family from Beaver Falls, NY. This was a half day trip and in the morning it was very windy and rough! We still managed to get our limit of trout and one really nice king. Had a great time with them fishing primarily off Calf Island in 130 feet of water. Great going ! Sunday I helped out good freind Briggs Williamson with a group from the Cortland / Syracuse areas. Weather cooperated a little bit better for us. We tried, tried and tried some more to get a few slamon into the boat......but after awhile the boys just wanted to catch some fish....and I knew right where to go. These guys were great....they grabbed the rods and reeled in the trout...even let some go. Had a GREAT time with these folks. 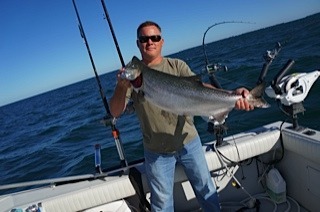 BTW...check out the one salmon that came off the Mega Bite hanging on the board....thats 34lbs. THANKS BRIGGS for the business! Sorry I have been busy with fishing lately. As I've been telling anyone that asks...fishing remains very good out of Henderson. We are catching everything currently with the exception of the Walleye. Trout and Salmon have remained good off the "Wall", and also in the shipping lanes. Flasher flies have been taking both Trout and Salmon. Bass fishing is good both along the High Rocks and around both Stoney and Gallo islands. Both live bait and soft plastics have been working. This last week saw a pair of Bass over 5lbs, and one over 6 lbs. Great weather to be on the lake. As they say,...pictures are worth a thousand words. Fourth of July Week - FISHING REMAINS GOOD! I was very busy over the course of the 4th of July Holiday ! Thanks to both "old" and some "new" customers. Fish were biting! Browns were in 40 - 50 feet of water, anywhere between 15 - to 30 feet down of the riggers. Warrior spoons and stingers were taking most of the fish. We also, tied into some salmon this weekend both off Calf Island and in the Shipping Lanes in between Gallo and the Duck islands. Salmon were taken on dipsey divers back 200 feet, with flasher fly combos, and off the riggers. Please note the pictures I took from the Phillip Oliver Party....kids love fishing! And when they spend a day on the water reeling in some monstrous trout the end result sometimes is a nice nap on the way in after the trip. I recently had the pleasure of working with several local captains with the Henderson Harbor Guiding Association in donating a 4 hour trip for 35 kids from Henderson - Belleville Schools. We all had a good time. We at first tried our hand at the Bass fishing for a few hours since that has been pretty good over the last several outings. Normally we have been limiting out at the "Lonely Tree", but the morning I took the kids there we really did not have alot of hits; and we lost a real nice one at the side of the boat, so I decided to try and catch the kids some of the Browns which have been very consistent all this spring. We found the kids a few browns, then went back in around noon. The West View Lodge cooked up the catch for the kids and we had a great Shore dinner for all the kids and the Captains that donated there time and there boats. The weather held out for us, and I even was able to teach the kids a few of the "super secret" names for some of the lures we used (Fat Nancy, Blue Tuxedo, Sunkist, Baby Shower). LOL!! For the bass opener we had a good friend and customer Mark Wilson from Amerstdam, NY and friends of his Tim, Luke and Chris from Connicut. Had a great morning casting mostly Rattle Traps and jigs to connect with some really nice bass. The biggest was caught by Mark Wilson and was good enough for 3rd. place in the local Henderson Harbor Derby. THAT FISH WAS 6 LBS, 4 OZ..... After limiting out we switched gears for awhile and caught some brown trout off the head on Stoney Point. Thanks again guys and hopefully we will see you soon for Salmon later on in the season. Over this last weekend I took out groups both days... Saturday we went for Browns and Sunday we tried the Walleyes. The Brown Tout fishing this spring has been very consistent with this last Saturday being some of the best Brown Trout Fishing we had in the last couple of weeks. The browns are still in relatively shallow water, anywhere between 10 - 20 feet, with planner boards taking the majority of our fish. The browns were hitting just about everything we had to offer with the stingers in the blue tuxedo being the best. We limited out on the browns by 12:30 - 1:00, then switched gears to some deep water lakers. I would love to be able to show everyone a "board " of fish but we had some technical difficulties with the camera. We met a new friend Kahn Chu Sunday to try and ice some walleyes Sunday morning. We started out at Bull Rock, in Black River Bay. Trolled along the northern shoreline of Black River Bay, middle of Black River Bay, and even the Sacketts Harbor Side. We only had a 1/2 day trip, we lost one 'eye off the back of the boat and boated one White Fish. Yippee! Marked a ton of bait and alot of fish out in 30 - 40 feet of water....but that was it! Its been a very tough year for Walleyes for sure. When we rounded Six Town Island on our way out to hopefully catch some browns I was really concerned that we were not going to get our day in. Skys were black, and looked like we could get some thunder and lightning at any time. The weather cleared and we had a great morning with my cousin, George "Bruz", Andrew, and Mike. Congrats to Andrew who just recently got engaged. We set up in the same place as we were the day prior. The sonar indicated a lot of bait in the area as well as "archs" surrounding the pods of bait fish. I had a great time catching up with everyone and we managed a few browns before they decided to pack it in early and head back. BTW the fish both days were for the most part coming off the inside boards, on stingers (Vampire and UV gator) in as shallow as I could get the boards along the shore line.